If I understand correctly not many Kashmiri families would encourage a child to be an artist. How did you manage to stay the course? I was born in an intellectual family, known for its scholars and poets. My father was a doctor he used to read many medical journals. As a child I used to flip the pages of the journals admiring the illustrations in it, when I was nearly 6 or 7 years old this admiration grew into a strong inspiration and I started drawing the illustrations that I liked. When I started drawing my father used to encourage me he used to appreciate my work, but when I told him that I wanted to take up art as a profession he was highly disappointed. He greatly opposed my decision of going to Mumbai to sturdy Art; he felt that there was no future for an Artist inKashmir. It was very difficult to convince him but finally he allowed me to go. Do you remember the first painting you made, what was it about, what inspired it? Yes I remember, the first painting that I made. It was the portrait of a man with a bandaged head. The bandage was slightly stained with blood near the temples.It was inspired by an incident of stone pelting that I witnessed as a child in 1960’s. What or who according to you is an artist? What constitutes art? According to me an artist is a very sensitive person with a keen observation and a creative bend of mind. Which artist has inspired you most? Do you have a favorite painting? As an artist Mr. G.R Santosh has inspired me the most, I have learnt a lot from him.Guernicaby Pablo Picasso, is my favorite painting. I find it to be an eternal reminder of the tragedies of war, ananti-warsymbolpersonifying peace. Do you classify yourself as an artist or you don’t believe in classifications? No I don’t because I don’t believe in classification. What are the main themes that you work around? I usually work on themes from my surroundings depictingKashmirin its various essences. How far does your own life experience inform your work? An artist’s life experience is an integral part of his works. My work greatly reflects my life experience. Do you find a great difference between the intent of your paintings and the perceptions it generates? No, I am quite satisfied with the perception my paintings generate it is very close to the intent of my paintings. How hasKashmir, its beauty, its tragedy inspired you? As I already mentioned an artist’s life experience is an integral part of his work andKashmirbeing very close to my heart has always been a part of my work, its beauty its tragedy my feelings for it all come together in my work. What are your views on theKashmirconflict that is so manifest for the last 60 years affected your work? The mind set of every Kashmiri has changed because of the conflict be it a child or an old man, I am no exception to this it has definitely affected my work because of it I have found a new medium including using of hues of mute colors to express myself. Has it brought any change to your perceptions about beauty, considering there is so much bloodshed and violence? Personally experiencing the 20 years of bloodshed and violence has forced me to paint a series of paintings portraying bloodshed and violence because you can’t notice beauty when there is violence around. How doesKashmirin its current situation define you as an artist or does it all? We are defined as artists in the current situation but the situation demands our contribution to the society to some extent through our own medium. Do you think an artist’s work, for that matter your work serves a political purpose? Or do you find art is forcibly used it in that field? Art has served political purpose throughout history for that matter my works have already been recorded as a strong and forceful political statement. LA Times published an article titled Art begins to flourish inKashmirwe want to know first hand about what you think of this resurgence? Due to the ongoing turmoil in Kashmir art took a back seat, but now it is reviving as the artist community ofKashmiris trying hard to restore it to its grandeur in the past. What is your vision for art and artists inKashmir? Kashmiris blessed with highly talented artists, if given the proper encouragement and exposure they have it in them to make a significant mark in the world of Art. You conducted an international art conference in the valley after a long hiatus, tell us about that? The international art conference was a huge success; it got a lot of support from various agencies inKashmir. The overall experience was very beneficial especially for our young artists who were able to interact with artists of various countries, and learn about newer forms and media of expression used all around the world. 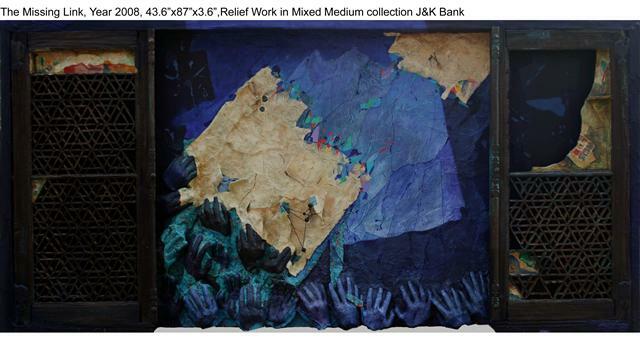 I am working on a series of relief works base on the cultural heritage and history ofKashmir. Which painting of yours is your favorite or near favorite if there is no definite choice? My favorite paintings are ‘A Peep out of the Past’and ‘The Missing Link’. Are you artistically happy with yourself (happiness of course is relative), but let us say at least satisfied or comfortable with where you are in your artistic journey? Yes I am satisfied to a certain extent, but art is an unending journey and I still have a long way to go. There are many things that I would like to do differently as I believe in doing things differently. I love to explore new mediums especially in my work. Just a curiosity, what is your favorite color and why? My favorite color is blue. I like the infinite spiritual depth it has.